Yaaawn!! Everyone we speak to seems to know that they should have their boiler serviced but very few actually do it. Think of it as going to the dentist for a check up. You don’t really want to but you know your teeth will last longer if you do. The dentist will let you know what you’re doing right or wrong and might even find a hole that needs to be filled. If your very lucky they’ll even give you a sticker. A boiler service is done once a year and is not a legal obligation. Make sure you don’t confuse it with the annual landlord’s gas certificate which IS a legal obligation if you are renting out a house, flat or spare room in your own house. A boiler service is just a clever idea. During the service we, at BeeXpress, will do a gas test to make sure there are no gas leaks (most companies will not do this during a boiler service). You might think you would smell a gas leak but that’s not always true especially when the gas pipe is running around the outside of the house. Then we will take the casing off the boiler and do a visual check of the inside of the boiler. We are looking for obvious signs of leaking or blackening of the inside of the boiler which could be a sign of something going wrong. Older boilers will be opened up fully and the heat exchanger will be swept clear. Newer condensing boilers will have the manual checked as the heat exchanger only needs to be opened every few years. 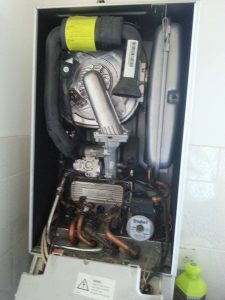 Valliant and Worcester Bosch boilers often need a new seal when doing the full service which puts up the cost of the work being done. Once the boiler is back together it is turned on full and measurements are taken on how much gas is being used and how much CO is being produced. Then these measurements are checked against the manual. If they are not within the correct parameters then we will adjust it to the correct readings. Once it’s all been checked and everything has been tidied up we will issue documentation that you will sign and will be emailed together with the invoice. If you want a boiler service then just call us on 020 8970 7489. You can take this free Boiler Servicing check list that has been prepared by Which. How Do 'A' Rated Boilers Work?